Heartland Montessori School follows the Montessori Method and philosophy of education. This method is child centered and offers an individualized system of assisting children to develop their individual talents and potentials. This method was founded on the concept of educating the "whole child". 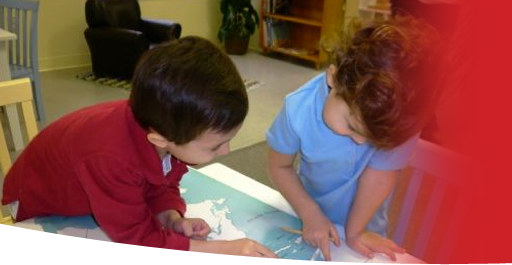 The Montessori approach provides social, emotional and physical, as well as cognitive development. Montessori children are often described as self-directed, courteous, and joyful with a true love for learning. Our professional staff is dedicated to providing a warm, loving, academically enriched environment that cultivates the development and growth of happy well-adjusted children. The Montessori Method is a product of the experiences and discoveries of Dr. Maria Montessori (1870-1952). In her life work, Maria Montessori recognized the extraordinary ability of young children to grasp the world around them. Dr. Montessori used the term "absorbent mind" to describe the delicate period of time between birth and 6 years of age, when children assimilate language, achieve movement and internalize order, evolving from a dependent infant to a proficient child in a matter of a few short years. Dr. Montessori believed that the developmental stage between birth and 6 years of age was a crucial plane of development. It is during this period of time that the child's senses are heightened, the child is interested in his world and needs to discover this new found interest through exploration and discovery activities. Through her observations of and work with children, Dr. Montessori discovered the amazing, and quite effortless, ability of children to absorb knowledge from their surroundings. Children do not learn from listening to an adult speak, but rather from sight and experience. Children teach themselves! "When a child is happy in their environment, and he or she is interested in working and experimenting, this leads to a calm and joyful learning experience which leads to inner discipline." This simple and profound truth inspired Maria Montessori's lifelong quest of educational reform, curriculum development, methodology, psychology, teaching and teacher training, all based on her dedication to further the self-creating process of the child.